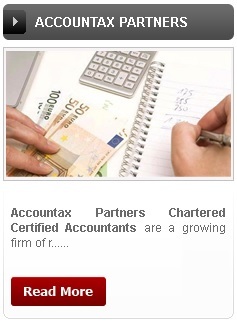 Accountax Partners Chartered Certified Accountants based in Bradford, West Yorkshire are a growing firm of reliable and caring accountants with experience in helping large and small businesses, the self-employed and individuals with their accountancy and taxation affairs. Accountax Partners offer business advisory services, and business start-up expertise and expert advice on personal, corporate tax matters, company accounts and payrolls. You can enjoy the peace of mind, assurance that a well-reputed firm can offer, whilst benefiting from experienced business, tax, VAT and accountancy professionals. You will find us friendly and approachable and we will not bombard you with the formality and jargon often associated with stereotypical accountants! We tailor our services to fit your own individual requirements and we will try to make your stress disappear. We can help you to conceive, believe and achieve! For prompt, cost effective and pain free services, we are the accountants you are looking for! So if you are a new business seeking help or you are merely looking to change to a more reliable firm of accountants, please do get in touch for a FREE consultation.